Just about every inch of Rome is worthy of a snapshot. Ancient ruins, Renaissance-era palaces, cobblestone alleyways, lush gardens, and magnificent churches all lend themselves well to photography, but there are some sights that provide the perfect background to travel photos. Here is a list of the best places in Rome for a photo opportunity. Saint Peter’s Basilica is visible from all corners of Rome, but a couple spots are well-suited for capturing the basilica on film. The most popular place to go for a photo of Saint Peter’s is the lookout from the Pincio Gardens. The Pincio perch is located above the Piazza del Popolo and can be accessed by walking up the Spanish Steps, turning left, and walking along a leafy path that goes past the Villa Medici. Another ideal place for a photo of St. Peter’s is from the top of Castel Sant’Angelo, which, like the Vatican City, is on the west side of the Tiber. In fact, the medieval monument was connected to the Vatican in 1277 via the Passetto di Borgo in order to provide an escape route and hideout for popes threatened by invaders. The Passetto is still visible but is not open to the public. It is hard to capture the colossal Colosseum in a photograph. Indeed, it is necessary to get a bit of distance from the ancient monument in order to get a good shot. A good place to do just that is on the Colle Oppio, the Oppian Hill, which rises just across the street from the Colosseum’s northeast side. Ruins of Trajan’s Baths are located on this hill as is the Parco di Traiano, a leafy park in which to have a rest before or after visiting the Colosseum and nearby sights. Tip: From the Colle Oppio, you can easily walk to the small church of San Pietro in Vincoli, which houses Michelangelo’s Moses sculpture. You need not walk far to find remnants of Rome’s illustrious past. Ruins are everywhere, but some are more picturesque than others. One of the most popular ancient sites is the Roman Forum, which is photo-ready from several vantage points. 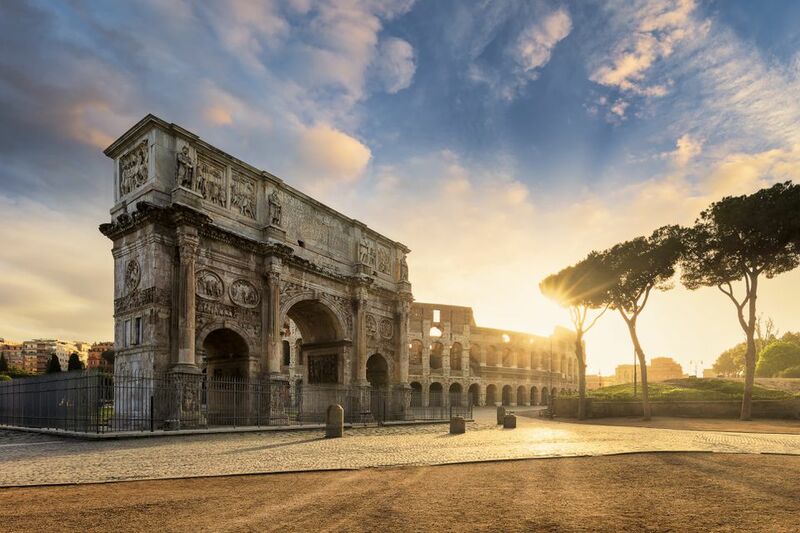 The Forum itself is sprawling, so it is possible to take fine photos in front of some of its landmarks, such as the Arch of Constantine or the Temple of Vesta. The Palatine Hill provides some sweeping views of the Roman Forum and has its own collection of ancient ruins, including the Stadium of Domitian. Perhaps one of the best places from which to capture the Roman Forum on film is from the Tabularium, part of the Capitoline Museums. From the Tabularium, the entirety of the Forum Romanum is perfectly framed, with the iconic ruins of Arch of Septimius Severus and the Temple of Saturn in the foreground. The Via Appia Antica, also known as the Appian Way, is another classic photo location. Ruins along this ancient road include the circular tomb of Cecilia Metella and the aqueduct near the Villa dei Quintilli. The Appian Way lies outside the south side of Rome’s ancient walls near the Baths of Caracalla, yet another set of ruins. If your itinerary allows for a day trip from Rome, consider visiting Tivoli or Ostia Antica. The former is home to the Hadrian’s Villa while the latter is reminiscent of a mini-Pompeii. An obligatory photo opportunity in Rome means posing in front of the Bocca della Verità, the Mouth of Truth, which is located in the entrance of Santa Maria in Cosmedin around the corner from the Capitoline and Palatine Hills. The legend surrounding this monument is that those who have been untruthful will have their hands cut off when sticking them in the mouth of the ancient sewer cover. It is unclear whether anyone has ever had his or her hand severed while performing this act, but the Bocca della Verità remains a favorite photo subject, especially for fans of the Audrey Hepburn/Gregory Peck film Roman Holiday.